COMPETITION TIME – Valentine’s giveaway from Baker Days! Baker Days have kindly given me the privilege of trying and reviewing one of their letterbox cakes. In addition, they have given me a letter box cake to giveaway to one of my lovely readers as a Valentine’s Day gift. You will be able to choose your own style, flavour and design. The cake will be posted to your choice of address to arrive in time for Valentine’s Day. This competition ends on Sunday 7 February to make sure everything is ordered in time to arrive for Valentines Day, so make sure you enter sooner rather than later! Click on the link above to enter. You will need to like my Facebook page, and share this post. I don’t ask people to comment as I know you are all busy. However, if you do want to comment, I would love to hear from you. Please read on to find out what is on offer. Whatever is a letterbox cake I hear you cry! 1. I said it out loud and I had 4 little people and one big person insist that turning down free cake was not the done thing. They would be happy to try it for me. 2. I became quite pre-occupied wondering firstly what a letter box cake is (apparently it is one which you order online and it is posted in a size which will fit through your letterbox), and then how on earth you post a cake including dropping it through a letterbox, without it going splat. 3. I checked out their website at http://www.BakerDays.com and realised that not only did their letterbox cakes look amazing, but they said they could put photographs on cakes. I was allowed to choose whatever I wanted. I have never seen a photograph on a cake before, so frankly, this was too good to miss! Not sure if I had got it all wrong, I sent them my Facebook page profile picture which is one of my favourites of the little people in their fuzzy suits at Christmas. 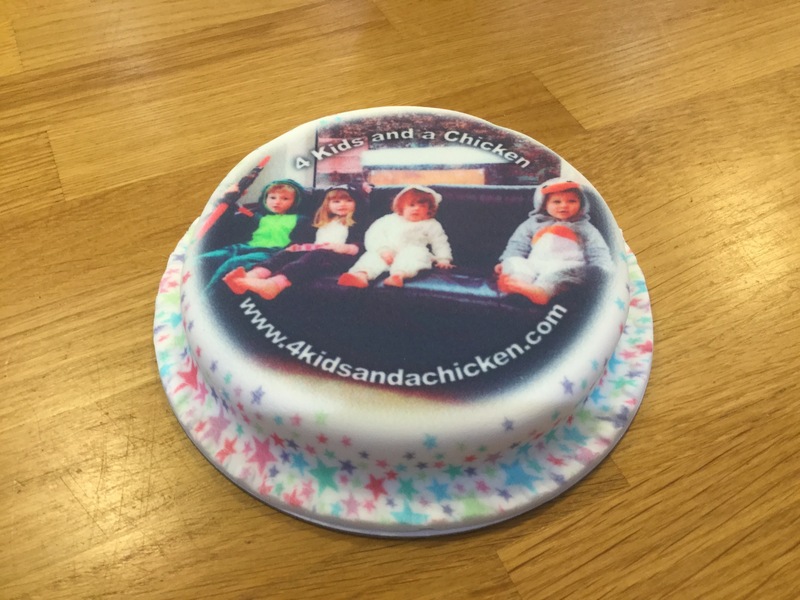 I asked for 4 Kids and a Chicken to be written on the top, and the website address on the bottom. I expect that I am probably behind the times, but I didn’t expect to see what I did! I waited to see what would happen. The next day, I came home from work to find a box waiting for me. It had been posted through the letterbox. I opened it and found a very pretty tin, a card, 2 packets of lovehearts sweets (yay, I love sweets!) and a booklet. I have to say that when I opened the tin, I could not believe my eyes. There, sitting in the tin was a stunning cake with a perfect replica of my photo on it, and the writing as requested. It really doesn’t matter if you like cake or not, you will want one of these little delights. The cake had survived the journey to and through my letterbox with not a whisp of icing out of place. The best bit is that even though you will not want to eat a cake as stunning as this, you have the consolation of a pretty tin to keep once the cake is gone. After many photographs and exclamations of delight (I actually took the cake to work and home again to show everyone how amazing it was before we ate it), we did the unthinkable, and cut the cake into pieces for us all to share. This was tougher than we thought, largely because the kids could not actually believe their eyes. 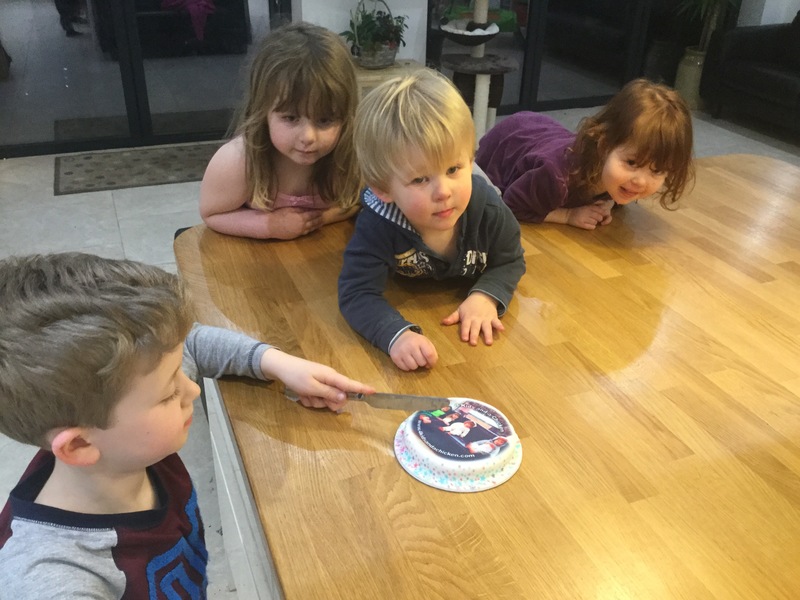 They could not understand how they had ended up on a cake. After promising each child could eat themselves, Patch set about cutting. You have a choice of a range of flavours. I went for Vanilla sponge with raspberry and apple jam. I will be honest and say that none of us could find the strawberry and apple jam. The cake was absolutely delicious nonetheless. There was lovely soft sponge (which it says keeps fresh for up to 14 days). The icing was also delicious, and there was what tasted like a lovely buttercream underneath. Despite the fact that as a rule, I don’t like cake, I honestly did enjoy this cake. The presentation and design is second to none. 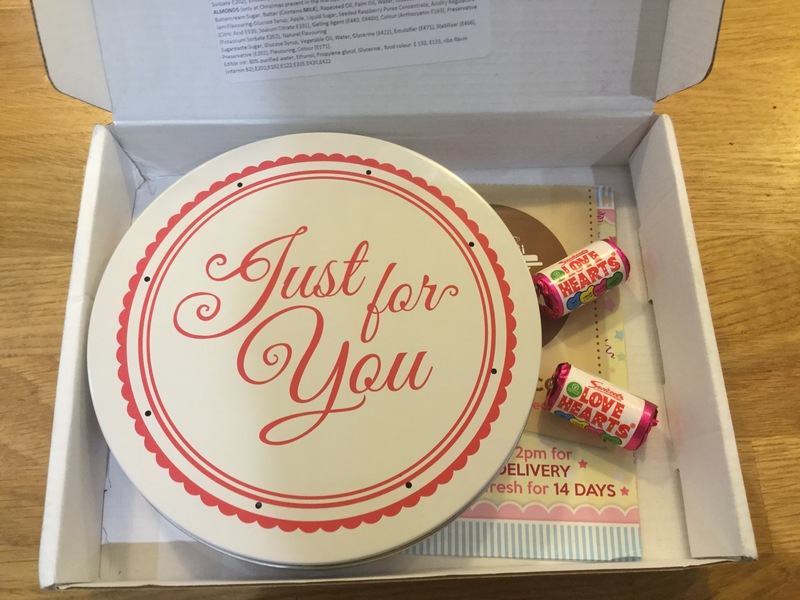 The fact that you can order before 2pm one day and have your personalised gift delivered the next day is, frankly, remarkable! I have to say that despite my initial scepticism I am a convert. I mean, who would send plain old cards on a special occasion when you could send a personalised cake instead! Good Luck everyone! Cakes all round.